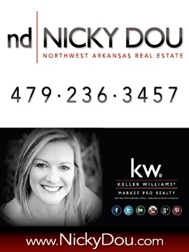 Homes Nicky Dou has SOLD throughout Northwest Arkansas. Keller Williams Market Pro Realty. Want YOUR HOME SOLD? Contact Nicky Dou today! Nicky, sounds like you are a very busy REALTOR, and nice promotion for your area.